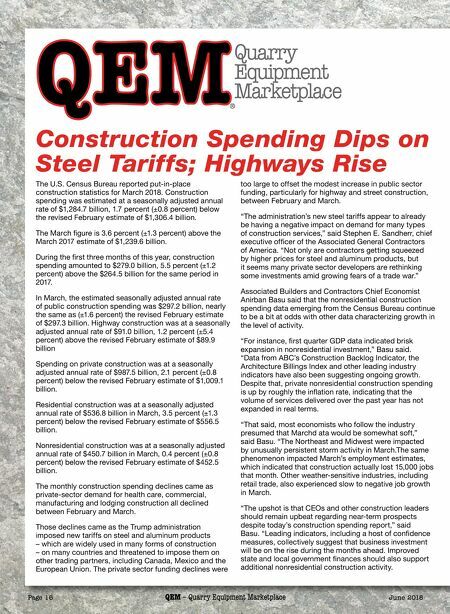 Page 16 QEM – Quarry Equipment Marketplace June 2018 June 2018 QEM – Quarry Equipment Marketplace Page 16 Q E M Q uarry Equipment M a r k e tpl a ce ¨ Construction Spending Dips on Steel Tariffs; Highways Rise The U.S. Census Bureau reported put-in-place construction statistics for March 2018. Construction spending was estimated at a seasonally adjusted annual rate of $1,284.7 billion, 1.7 percent (±0.8 percent) below the revised February estimate of $1,306.4 billion. The March figure is 3.6 percent (±1.3 percent) above the March 2017 estimate of $1,239.6 billion. During the first three months of this year, construction spending amounted to $279.0 billion, 5.5 percent (±1.2 percent) above the $264.5 billion for the same period in 2017. In March, the estimated seasonally adjusted annual rate of public construction spending was $297.2 billion, nearly the same as (±1.6 percent) the revised February estimate of $297.3 billion. Highway construction was at a seasonally adjusted annual rate of $91.0 billion, 1.2 percent (±5.4 percent) above the revised February estimate of $89.9 billion Spending on private construction was at a seasonally adjusted annual rate of $987.5 billion, 2.1 percent (±0.8 percent) below the revised February estimate of $1,009.1 billion. Residential construction was at a seasonally adjusted annual rate of $536.8 billion in March, 3.5 percent (±1.3 percent) below the revised February estimate of $556.5 billion. Nonresidential construction was at a seasonally adjusted annual rate of $450.7 billion in March, 0.4 percent (±0.8 percent) below the revised February estimate of $452.5 billion. The monthly construction spending declines came as private-sector demand for health care, commercial, manufacturing and lodging construction all declined between February and March. Those declines came as the Trump administration imposed new tariffs on steel and aluminum products – which are widely used in many forms of construction – on many countries and threatened to impose them on other trading partners, including Canada, Mexico and the European Union. The private sector funding declines were too large to offset the modest increase in public sector funding, particularly for highway and street construction, between February and March. "The administration's new steel tariffs appear to already be having a negative impact on demand for many types of construction services," said Stephen E. Sandherr, chief executive officer of the Associated General Contractors of America. "Not only are contractors getting squeezed by higher prices for steel and aluminum products, but it seems many private sector developers are rethinking some investments amid growing fears of a trade war." Associated Builders and Contractors Chief Economist Anirban Basu said that the nonresidential construction spending data emerging from the Census Bureau continue to be a bit at odds with other data characterizing growth in the level of activity. "For instance, first quarter GDP data indicated brisk expansion in nonresidential investment," Basu said. 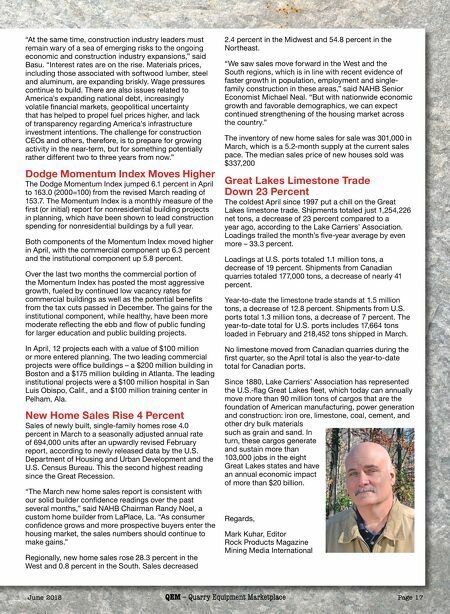 "Data from ABC's Construction Backlog Indicator, the Architecture Billings Index and other leading industry indicators have also been suggesting ongoing growth. Despite that, private nonresidential construction spending is up by roughly the inflation rate, indicating that the volume of services delivered over the past year has not expanded in real terms. "That said, most economists who follow the industry presumed that Marchd ata would be somewhat soft," said Basu. "The Northeast and Midwest were impacted by unusually persistent storm activity in March.The same phenomenon impacted March's employment estimates, which indicated that construction actually lost 15,000 jobs that month. Other weather-sensitive industries, including retail trade, also experienced slow to negative job growth in March. "The upshot is that CEOs and other construction leaders should remain upbeat regarding near-term prospects despite today's construction spending report," said Basu. "Leading indicators, including a host of confidence measures, collectively suggest that business investment will be on the rise during the months ahead. Improved state and local government finances should also support additional nonresidential construction activity.